Le Tour de Deux Festivals du Tandem! Scallops oysters and champagne?! No one told us festivals were like this! “Do you fancy going to a festival?”, the “old git” had casually asked the “old gal” a few weeks ago? 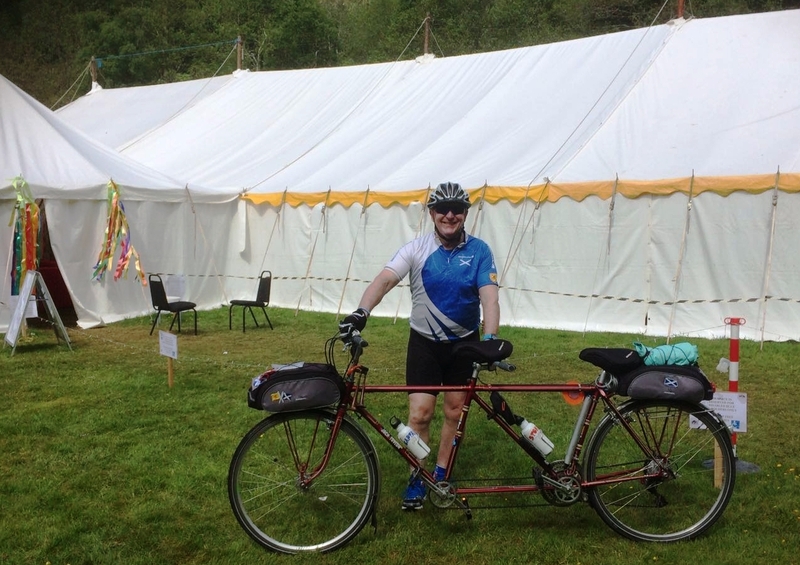 “In fact do you fancy going to two festivals in tandem, by tandem on the same day?” he asked. The response wasn’t immediately enthusiastic it would need to be said – from either of my dynamic crew! Perhaps it was those traditional images of huge crowds of people standing soaked and caked in mud at somewhere like T in the Park that came to mind. And another off putting factor was that the “old gal” and the “old git” most definitely don’t do camping! 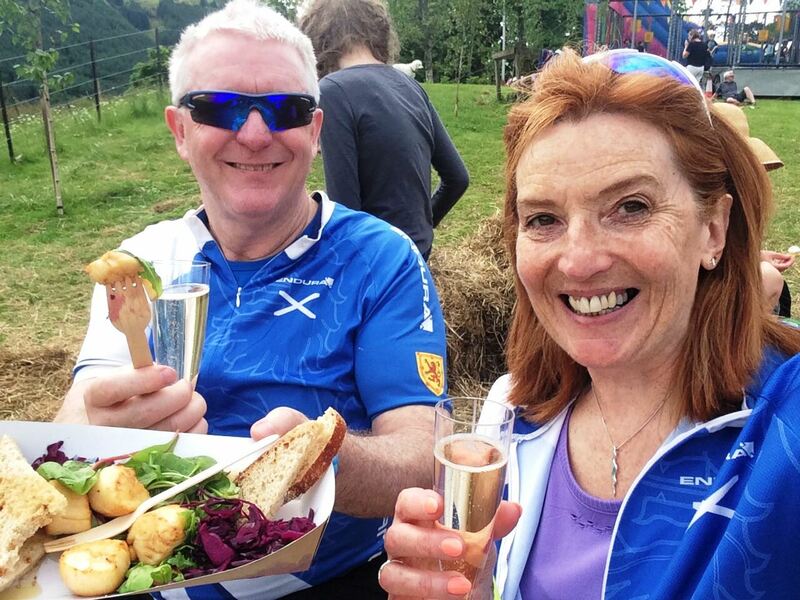 But they decided they would lose their festival virginity with a planned day trip to Strathyre to tandem between two festivals being hosted on the same Bank Holiday weekend within Rob Roy Country. So Sunday dawned and the weather was nice and sunny as we headed off early from Matildas Rest, with a little trepidation for what the day may bring. 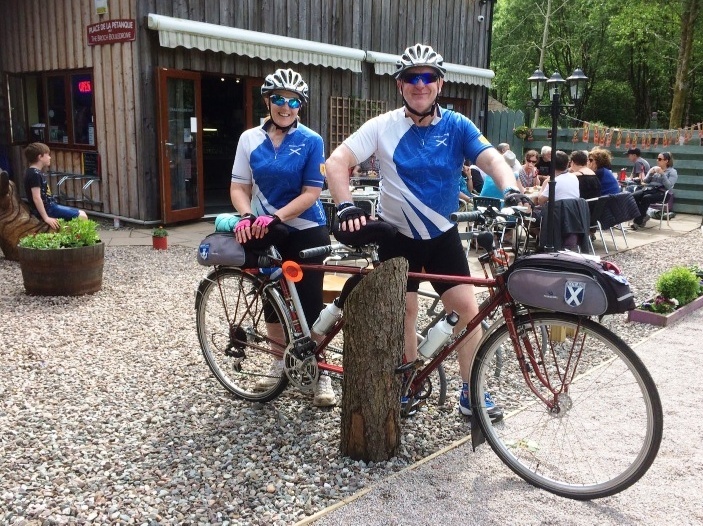 The start point for Team Matilda’s Le Tour de Deux Festivals du Tandem was the fabulous Broch Cafe in Strathyre – where we had been invited to park Matilda Transport by the friendly owners Lesley and Bill. Even tho it was just around 10 o’clock the cafe had a great buzz about it with orders for hearty breakfasts flying out of the kitchen. Team Matilda – all kitted up in their Saltire cycling tops ready for the off at Broch Cafe. After a welcome Lucaffee coffee and delicious home made scone there was time for a quick photo of my dynamic crew all kitted up in their matching “Sunday best” Saltire cycling tops, before we headed off out of Strathyre on the super smooth surface of the Sustrans Scotland NCR7. You can check out the details of our route on Strava below – and don’t forget to click on the map image to be transferred to Strava to get the full data and statistics! Before we built up any speed however, our first task was to look out for the site of a newly commissioned installation on the award-winning unique cultural outside art #BLiSStrail, named after the four villages it links – Balquhidder, Lochearnhead, Strathyre and St Fillans. 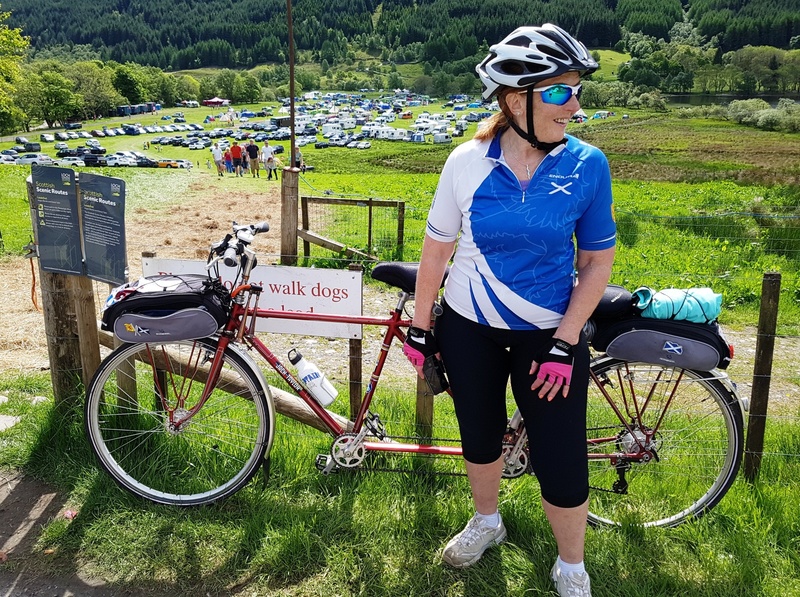 The trail is the brainchild of LETi, the local Loch Earn Tourism Information group, to encourage more visitors to the area – to boost tourism and the local economy. 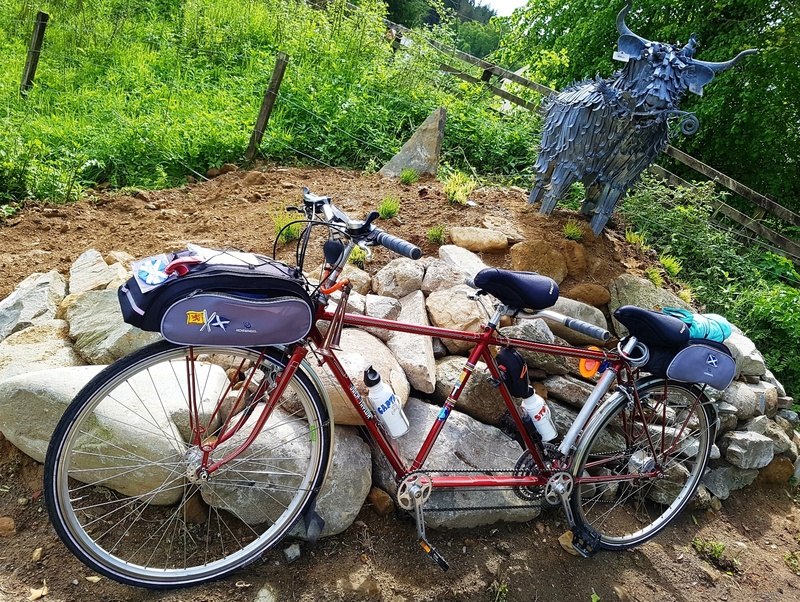 We quickly found Drover’s Bho – a Highland Coo metal sculpture made by Kev Paxton’s ArtFe to mark the old cattle drovers route which has just been added to the BLiSStrail to mark 2017 being the Year of History Heritage and Archaeology. Drovers Bho – the new BLiSStrail artwork. Spot the bramble eating mouse on his head! The artwork has been beautifully landscaped to give the impression of the coo standing on a hilloch and really makes it feel at home! The intricacy of the metal artwork has to be admired – and the “old gal” was quick to spot a bramble-eating mouse on his head! 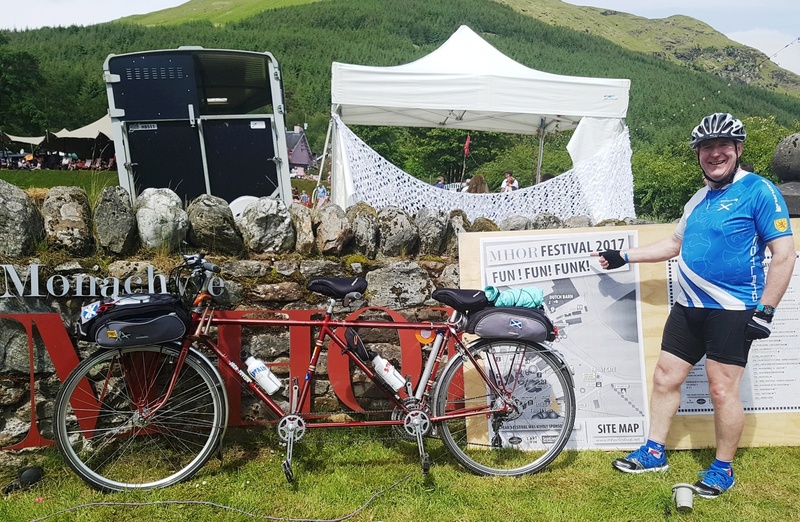 Back on my saddles, my crew tandemed off picking up a fair speed on the off-road cycle path heading for our first destination of our two festival tour – the Mhor Festival being held in the grounds of the stylish boutique Monachyle Mhor hotel. Billed as the best “off the beaten track” festival in Scotland it promotes itself as a festival of food, drink, music, theatre and dance! As the festival web site says: “Come, play, sing, dance, cook, learn, chill!” Well, ok,if you insist! And the organisers agree that arriving by tandem is ideal, as it saves having to use the bus on the traffic management system on the narrow roads! The approach gave my crew the opportunity to ride again on one of the best routes Team Matilda have had the pleasure of experiencing – gently undulating single track roads with the most wonderful views across Loch Voil within the Loch Lomond and The Trossachs National Park. And with hardly a whisper of wind, the loch’s surface was like a mirror, reflecting the surrounding hills. Truly magnifique! The camp site at Mhor Festival must be one of the most scenic festival camp sites ever. As we rounded the final bend we were greeted with the first view of theMhor Festival site. The campsite, just on the edge of the loch, has to be one of the most scenic festival sites ever. With thousands of people already enjoying the party atmosphere it looked like my crew were going to have fun – especially as the “old git” spotted a sign promising “fun and funk”! The “old git” and me looking for fun and funk after arriving at Mhor Festival. 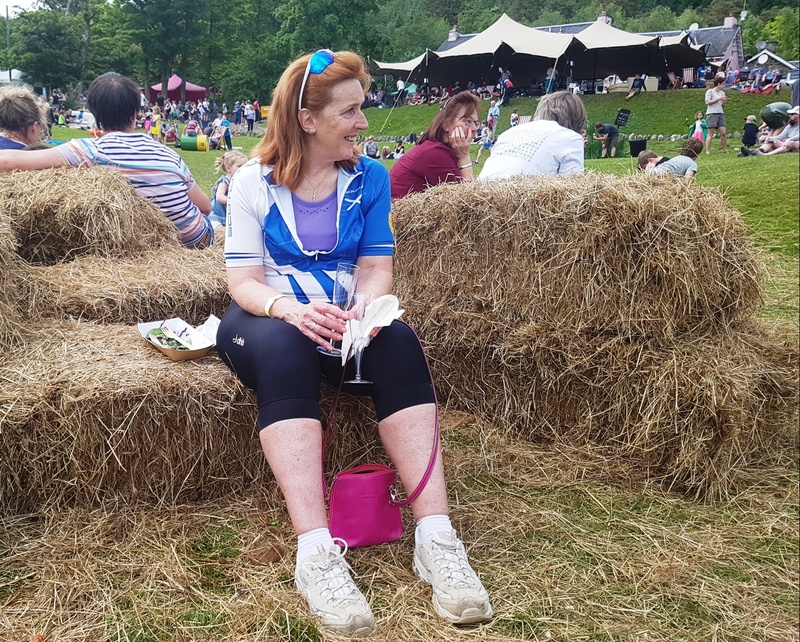 The festival organisers at Mhor had arranged for VIP admission tickets for Team Matilda – which I am sure must have been a result of my recent appearance on on BBC Scotland’s Landward television programme promoting Loch Voil area as our favourite picnic spot! I was safely parked up in the staff car park as the my dynamic crew entered the festival site – and were immediately taken by the friendly nature of the event. And there was so much going on – dance, music, comedy, art, theatre and of course some amazing food and drink including a champagne and seafood bar. The “old gal” decided that festivals may not be that bad after all! 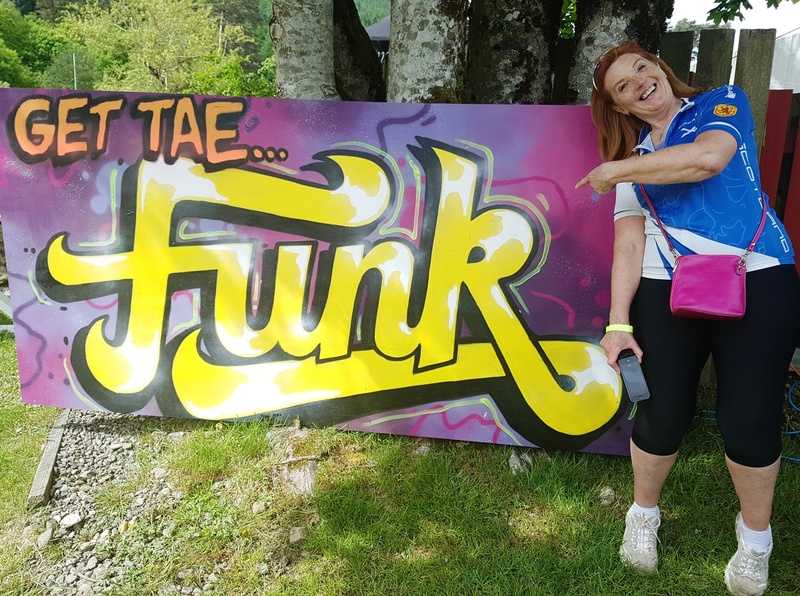 She was quickly impressed with the funky nature of the festival and had to pose beside one of the many amusing eye-catching signs dotted around the site. Cheers – some yummy seafood for alfresco lunch. What’s not to like about festivals? After lunch my crew bumped into Kim Proven – the enthusiastic chair of LETi and owner of Briar Cottages at Lochearnhead – along with her husband Fraser who were enjoying a cool jazz funk band playing in the main arena. The “old git” naturally took the opportunity to remind Fraser of his (whisky induced) promise to ride me backwards! He claimed he hadn’t forgotten but also said he needed to get some practice in – so was somewhat vague about agreeing a date to show off his circus skills! One of the joys of the event for my crew was just chilling and relaxing in the warm sunshine. The festival site had a lovely relaxed feel about it which was great for people watching. The festival site had a lovely relaxed feel about it – great for people watching! The afternoon seemed to slip past and all too soon it was time for my crew to retrieve me from the car park and tandem back into Strathyre for the second part of our festival tour. It was an interesting ride back along the single track road as it was quite busy with cars leaving the site and we had to slow down and let cars pass at virtually every single passing place. But free of the confines of the single track road the “old git” was able to go up the gears and we clocked a new Team Matilda speed record of 32.4 mph on a nice downhill stretch! I was almost giddy with excitement! I mean it is many years since this “old lady’s” wheels have turned that fast! Our tandem back from Mhor ended up where we started, back at Broch Cafe – just yards from the venue for our second festival of the day, the Strathyre Music Festival. Time for one more picture of the “old git” in front of the large marquee which hosts the festival, before I was packed away in Matilda Transport so my crew could concentrate on enjoying the music! The “old git” outside the large marquee for the Strathyre Music Festival. Lesley and Bill kindly let us change out of our cycling gear at Broch Cafe into more relaxed clothes more suitable for the music festival. We could already hear the bands playing but there was an additional attraction for my dynamic crew – Bill had fired up a bbq outside the cafe – and it was busy with festival goers looking for some food. The “old git” and the “old gal” were hungry again after their tandem ride and naturally had to sample the nosh! I am reliably told that the steak burgers with cheese were delicious! So good in fact (and whisper this bit!) they had seconds! 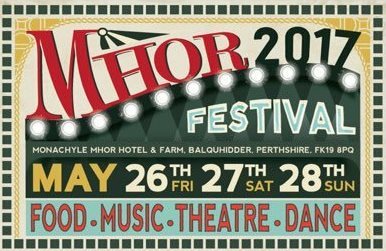 The Strathyre Music Festival is the second festival to be held in the area over the Bank Holiday weekend. And it must be one of Scotland’s best value festivals with an entry fee of only £5 per day. The music festival started from the success of local band Balvaig. 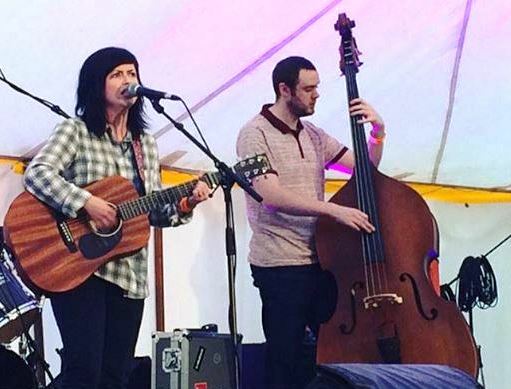 Led by Kenny Higgins, who is also vice-chair of LETi, the band is a group of highly talented local musicians and singer songwriters who regularly meet for bothy-style folk and blues music sessions. The festival has rapidly grown in stature and size and is now in its fifth year. It is recognised as the largest small community based music festival in Scotland – renowned for its fantastic family friendly atmosphere in a beautiful setting. The early Sunday evening session was a bit quieter than the late Saturday session when the marquee was mobbed for a set by Mudslide, a 5-piece blues band. But my crew were able to relax and hear a set set by Hugh Kelly, an alternative blues/soul singer songwriter. This was followed by a performance from Martha L Healy which explored country, folk, bluesceltic and Americana. Martha L Healy performing her set at the Strathyre Music Festival. Dipping briefly into the festival my crew experienced the friendly nature of it all before tiredness started to kick in for my crew after a long day in the sunshine, and they decided to miss the headline act of Papa Shandy and the Drams. So after bidding farewell to Lesley and Bill – who were still busy serving up food – it was time to drive home. After returning to Matildas Rest the “old git” checked Strava to find that they received eight on the ride – four personal bests and four second best times! Strava officially recorded the ride as a distance of 16.4 miles with a total moving time of 1 hour 49 minutes. Average speed was 9.1 mph, with a top speed being a giddy 32.4 mph. The elevation covered was 540 feet, as we managed to burn up 1002 calories, and produced an estimated average power output of 137 W.
What a fantastic day in the sunshine for Team Matilda at our first ever festivals! Let’s just say that my dynamic crew enjoyed it so much they are already planning to come back in 2018! You never know, we might be able to persuade some other tandems to join us! Yes Jane it was a superb day – maybe Bluebird would like to join us for the 2018 Mhor Festival It really was a very sophisticated and enjoyable event! And the venue set overlooking Loch Voil is just amazing! As for calories – do they count when tandeming??!! And very proud of my new top speed of 32.4 mph – however I don’t think I a am going to get anywhere close to Bluebird’s recent speeds of near 40 mph! Wow, 32.4mph! Matilda and her crew just get mhor and mhor impressive! 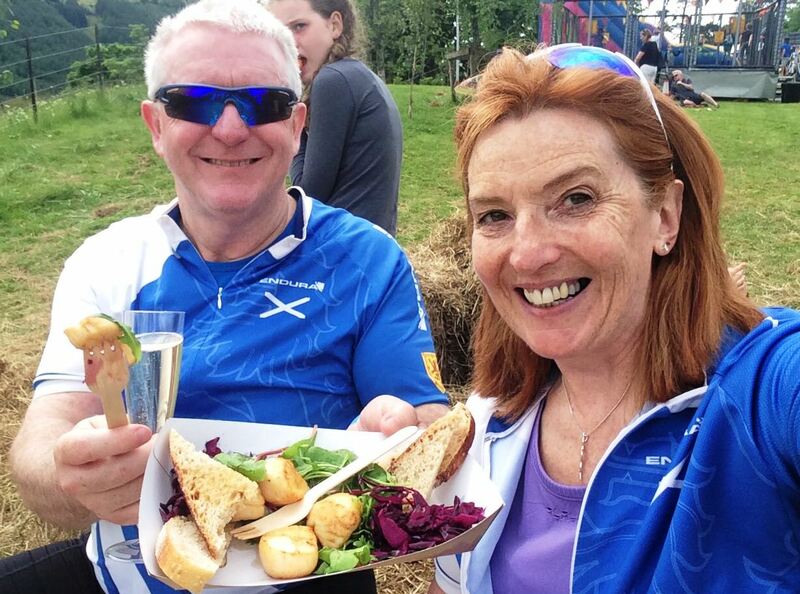 I put it down to those snazzy aerodynamic saltire tops…plus the oysters! Ouch – the “old git” is both cringing at that pun … and wishing he’d though of it first! But yes we can pick up a fair bit of momentum – but only going downhill!! !